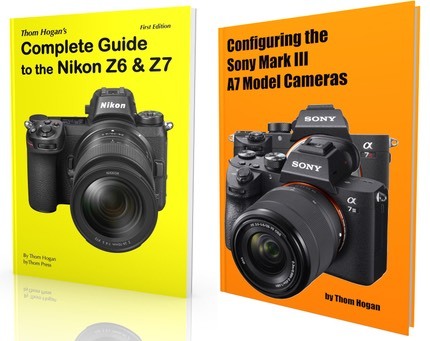 As I noted in my other article, Nikon effectively ghosted their Nikon 1 customers for over two years between the quiet introduction of the last Nikon 1 (J5) and the complete discontinuation of Nikon 1 gear. The failed DL launch—a compact camera line that used the same 1" sensors—probably had a lot to do with that. Had Nikon been able to spread sensor use over five or six models I suspect that the Nikon 1 line might have continued in some form. Nikon made a business decision that factored R&D and parts costs against what they thought was the market size. The ROI and profit numbers apparently didn't work for them. In essence, the engineers failed (with DL), which caused the accountants to declare that all 1" would fail Nikon's margin tests, while the marketing department wasn't able to clearly override the accounting group's numbers by demonstrating clear demand-creation capability. Thing is, that decision wasn't about product. It was about yen. When the Nikon 1 first hit the market in the fall of 2011, something interesting happened. Nikon cranked up the marketing engine big time. That was one of only three times I've seen them get marketing relatively on point and in customer's faces during the digital era (the other two times were the introduction of the D40 generation consumer DSLRs and the D3/D300 combo). Nikon didn't have much choice. DSLRs were in complete disarray due to the quake/tsunami impacting Japan in spring of 2011, plus the floods in Thailand in late 2011. That had the direct impact of pushing back product introductions (D3 and D700 replacements), probably cancelling some (D400), and had Nikon struggling to limp by with the existing DSLRs as they had to rebuild two primary manufacturing plants and deal with parts supply issues for them, because many of their vendors were also impacted. The Nikon 1 was built in China, and with perhaps the exception of a couple of parts—of which there were fewer than 300 in the J1 and V1—was what they could build in quantity, and thus what they had to promote. Which explains why we got such a huge Ashton Kutcher-led marketing thrust. Several of the Nikon 1 products are going to be classic and collectable. As much as you might malign the small sensor and some of Nikon's odd feature and performance choices, one fact remains: the Nikon 1 cameras and lenses are the smallest and nimblest ILC gear you can find with good to excellent image quality. The J5 is pretty close to a Sony RX-100, but with interchangeable lens support, for example. And I like the RX-100 a lot. So what Nikon 1 products do I think will become classic and collectable? I just mentioned the J5. I think that's a given, as it is the best sensor the Nikon 1 has had in the best EVF-less body Nikon made. On the EVF side, I think the V1 and V2 are the clear choices, for different reasons. The V3 is a love it or hate it camera, so much harder to predict. Plus we have the AW1, something that's still unique to this day. All the bodies were produced in enough quantity that there should be enough around to meet collecting demand. Lenses are a different story. All the lenses were pretty good, but the ones you're going to have a hard time finding because the demand will far exceed supply are: the 6.7-13mm f/3.5-5.6, the 18.5mm f/1.8, the 32mm f/1.2, and of course the 70-300mm f/4.5-5.6, which made the Nikon 1 a birders delight (at least in good light). Of those, the wide angle zoom and telephoto zoom are the two hardest to find already. Neither was made in huge quantities to start with. The 10-100mm f/4-5.6 also gets a bit of a nod for collectors, but it's pretty easy to find. Seriously, I fully expect to find some Nikon 1 shooters (though rarely) five years from now. There's basically nothing like the Nikon 1 products available today, and they have a high level of performance for their size and weight. As I write this, a V2 with the 10-100mm and 70-300mm would set you back less than US$1000. That's 28-810mm folks. Fits in a couple of (largish) jacket pockets. The RX-100 might cover you in 24-200 now, but below and above that only the Nikon 1 suffices at 1". And the lenses that let you do that were quite high quality. There have to be employees within Nikon that wish they hadn't cancelled the Nikon 1. Moreover, that the designers weren't hobbled with some don't-compete-with-DSLRs declarations within the company. It doesn't take much imagination to get to a near perfect pocket ILC with a small stable of very useful lenses. Nikon never quite went that far, though. They hinted at it, they poked around the edges, but they didn't quite get all the meat on the table. And then the accountants came in with their cleaver and lopped off what remained. So we end up with a slightly flawed and not-quite-what-we-wanted classic only available used. Which will still be interesting five years from now, I think.